I'm actually an agnostic when it comes to ghosts, but if I hadn't experienced what I'm about to tell you then I'd probably be a fully-blown sceptic. 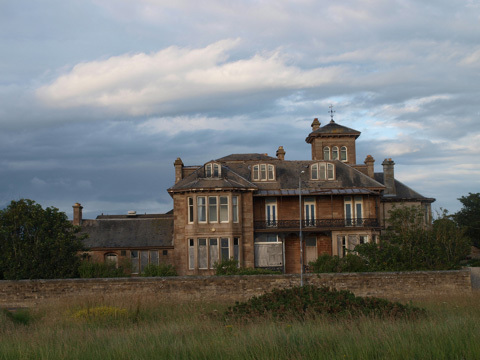 Sitting on the Scottish coastline in Troon, Ayrshire is a nineteenth century villa called Crosbie Towers, beautifully crafted and in the Italianate style. It is well-known in the local area and you can find pictures of it online, both in its current and former state. Even when it degenerated into a derelict and poorly-maintained building, the mansion still looked quite elegant. And scary. 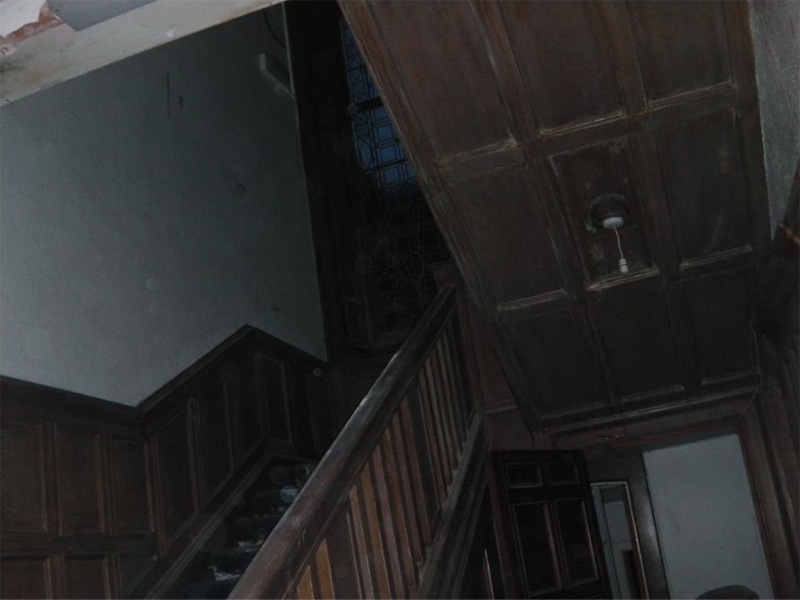 When we ventured inside on a calm evening in May 2012, it really was your proverbial haunted house: dusty floors, wooden panels, boarded-up windows, a broken-down elevator, a creepy dentist's chair, and a spiral stairacse leading up to a square tower. There was debris everywhere, old chairs and furniture, and the air was rather heavy and musty. It smelled like an old library. My friends were just approaching the foot of the staircase when a loud, crashing bang sounded from the top. I was at the back of the queue, admittedly not the bravest of the bunch on this occasion, but the noise and shock will stay with me forever. We bolted out and returned several nights later. You could say that a homeless person or another explorer orchestrated the bang to scare us away, but that would seem an unnecessarily severe measure to take. That bang was angry, sinister even. It wasn't like an object was just dropped or thrown casually; there was great force and will behind it. Still, I would have granted a human cause as the likeliest explanation were it not for what we would soon discover. There is a room at the top of the staircase and although none of us ever stepped inside it (let alone the whole second floor), we know there was a window in that room which looked out onto the backyard. A photograph we took of the window revealed something uncanny: what looks like a narrow white face with black slits can be seen peering down at us, as if it didn't want to be seen. Now, here's the important point. This 'face' or whatever it is didn't appear in other photos of that same window which were taken on the same night, meaning the thing was literally there and then it wasn't. It can't have been a handle or part of the actual frame. When we reconsider the bang and add the photo into the equation, putting two and two together, it becomes pretty clear that the bang was caused by something in that room which didn't want us coming upstairs. If not, then I dare anyone to tell me what the thing in the photo is, bearing in mind the context, because I really can't explain it. As for the history behind the house, I've done my research. People have definitely died there. Renowned whisky-maker Alexander Walker - whose brands are now marketed all over the world as 'Johnnie Walker Whisky' - is listed as dying in the house on 16 July 1889, as is his wife Isabella McKemmie in 1902, at 'Crosby Tower', obviously an alternative spelling or a misspelling of the house's real name. The property later went on to become a care home and then, bizarrely, property of the Church of Scotland. It makes for intriguing reading. And don't just take my word for it. All this information can be found online with a quick Google search. See for yourself. I even discovered pictures of Mr. And Mrs. Walker on their wedding day, along with their death certificates. Could the spirits of Alexander and Isabella be behind the mysterious bang and the face at the window, defending their beloved old home from youthful intruders like myself? Its admittedly a longshot, and I'd rather not resort to paranormal explanations if I can help it, but I still find it unlikely that another living person could have been in that house at exactly the same time as us on multiple nights (because the photo was taken days after the bang on another visit) AND been responsible for the crash on the staircase and the face at the window. For one thing, the face doesn't look at all human. I still dream about the house from time to time, regretting how I never took the opportunity to explore the place more fully or reach the top floor. The building was recently modernised into a block of flats, which I think looks terrible (again, you can find the relevant pictures online). For the sake and mental well-being of whoever now lives there, I hope the ghosts aren't permanent residents. The following comments are submitted by users of this site and are not official positions by yourghoststories.com. Please read our guidelines and the previous posts before posting. The author, MichaelM95, has the following expectation about your feedback: I will participate in the discussion and I need help with what I have experienced. Very interesting to watch, that was beautifully read! Also, I couldn't help noticing your Northern Irish accent. I just viewed your link on YouTube. I thought it was fantastic how you credited 'Your ghost stories' as your source. That way people who are interested in real ghost stories can not only read our stories but also submit theirs. How many more have you got lined up? I look forward to your future posts and comments. Thanks very much Michael, will do! Sure, be my guest. I'd be interested to see that if you put it up. Maybe you could paste the link here, or send it to me? I was wondering if you'd be interested in allowing me to use this on a new youtube channel I'm starting up, solely focused on real life ghost stories? I think it's fabulous and just what I'm looking for in terms of content! Amor, thanks for your comment. Yes, we do have a lot to explore here. Britain, and especially Scotland, do have a lot of cooler older buildings and a rich history (though that shouldn't necessarily mean more ghosts, if ghosts are real). I agree, we must seek logical explanations first even if the paranormal makes for a more thrilling interpretation. Well, we can boil the logic down to this, I think: since the figure/face (?) in the photo can't be part of the window (because it didn't appear in other photos), then it must logically be someone inside the building wearing a mask or an unknown entity/ghost. You are right that, since we could get in by removing the wooden board over the door, then someone else could easily have done so, perhaps a homeless person. However, as I discussed in previous comments, things get a bit murky because, if it was a person at the window, they must have been wearing a mask, which seems quite an effort to go to, and we heard no noises that night in the house, so they can't have wanted us gone in a hurry (despite the distinct bang we heard nights before). Therefore, if it was a real person, I'm left a bit baffled by their motives and why they would have a mask and yet not show their full face to our cameras. Surely the whole point of a scary mask would be to make it known at the window and scare us away, but in the photo only a minute portion of a face/mask can be seen. The whole circumstances were just strange and don't match up easily if it was a real person, but of course that doesn't mean I'm saying it wasn't a real person, just that they must have went about the whole thing in a subtle way. If you can get in unattended, then people may have before you, too, which what you have mentioned. Hi Michael, thanks for sharing your story to us. I have just skimmed through some comments, not sure if somebody mentioned but it is a rule I learned here to rule out first any logical explanation before you can say it's paranornal. Which you said you weren't able to do. But that's okay. Makes for a good story. I also saw the photo but didn't see any out of ordinary. Maybe I'll try again tomorrow. :) You folks are lucky with all the available old buildings to explore, seeing history yourself, eaten away by time. Would love to explore such buildings if there is any here, without fear of being charged with trespassing or getting mugged by malevolent occupants. And thank you all for the interesting and pleasantly analytical analysis into this event, not bringing any assumptions to the table. Also forcing me to consider the phenomenon from different angles than before. As a spectator viewing the photo and circumstances from afar, so to speak, I can't blame you for thinking it a case of paredolia, at least as an initial assumption. Ockham's Razor would probably suggest that it is just somebody in the room with a mask, but maybe the paranormal isn't actually a less simple explanation. As you say, I guess we'll never know what was in there watching for us. Thank you for coming back to my comment. As I said, I am guilty on theses cases of photographs. In order to agree that there was a real supernatural entity I'd had to see it full bodied and wait for experts' opinions on possible alterations (please note that I believe your photo hasn't been altered and it's real). But I don't dismiss your encounter, it was you who were there, you felt the atmosphere, you know what you are talking about. I'm leaning towards pareidolia because it is the most common situation, my first thought was that something was hanging from the ceiling and caused the effect. But I can't say I am 100% right. Thanks for your comment but I must say in response that were it a case of paredolia, for example a window handle that simply looked like a face, it would have shown up in every photo of the window. Plus we would have been freaked out immediately on our first visit if we saw that at the window, mistaking it for a face, but with our own eyes we never saw anything in that window in all the times we went there. I do admit the 'thing' is pretty well-camouflaged, matching the white of the windowpane and the blackness of the room beyond. Interesting experience, I do believe that places with history to be haunted. After all, there should be a lot of energy retained outside and inside the walls. There were at least 2 deaths in the villa/mansion, so there must be someone or something lingering there. But after seeing the photo what came to my mind (and yes it does look like a face or mask) is that there might had been something hanging from the ceiling which caused it to look like a face, alien or mask. This is called pareidolia, a phenomenon that can cause people to perceive random images, light or shadows as faces. So for me the picture is inconclusive. You took several pictures of the same window and nothing appeared there, but for pareidolia to happen it only takes a certain perspective, of light shadow, patterns. Our brain needs stimulus, and needs to find a pattern, maybe this was it. Please understand that I believe that you have experienced paranormal activity in the house, I just don't think the photo can prove it as for me this is only pareidolia. Once again, thank you for sharing such interesting account and providing us helpful information. RSAChick, thanks for the link to the article and photo - creepily interesting. There's definitely an object in that window giving the 'evil eye'. Thanks for answering my question. It looks like you have some decent evidence that 'something' is residing at Crosbie Towers. It's difficult to say what that something is, but I'd put it in the category of otherworldly/paranormal. Wow! I just viewed the link. Thank you RSAchick. It's clear as day there is a foreign/extraterrestrial face looking out of the window. Thank you for sharing this experience. Also thank you RSAchick for posting the link. Yeah, the person who took the photos snapped them seconds or minutes apart, but definitely on the same evening. Basically the window overlooks the back entrance to the house (the only entrance as far as we were aware, and even then you had to move a wooden board off the door). She called us out the first floor and told us to look at the photos to see the 'thing'. One or two showed the blank window, the other showed the window with the face. There was no doubting. We were physically present on the scene to see that. There wasn't enough time for digital manipulation and, to be honest, she wasn't smart enough to do that anyway. Even without looking at the photos, we could look right up at the window and clearly see there was nothing there. Yet in that one photo something was there. I'd recommend the 2 or 3 videos on Youtube of another group of youths exploring the grounds around 2010. There were some nice extended gardens that weren't there in 2012. 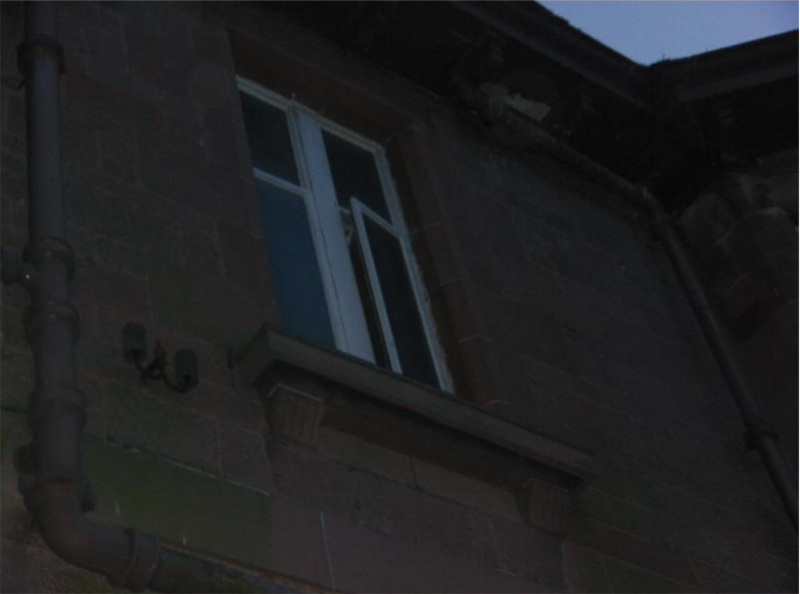 The back entrance and the small window in question (just above the entrance) can be seen part way through 'Exploring the Rooms Part 1' (I think), though I regret to say nothing really paranormal happens in these videos. Very interesting account. I also read the article and studied the photo (thanks for the link RSAchick). I would say the most compelling evidence is the face (or object?) captured in the window after previous photos show nothing. Were the photos taken at the same time (seconds or minutes apart) and from the same perspective? Thanks for sharing an intriguing read. Thank you so much for the link. I will click it now and have a read. Interesting, creepy photo and story! Steve, there's a newspaper article online from 2016 about our experiences at the house, though in a much less detailed form, and the reporter got some things wrong like claiming the house used to be a castle (whether out of falsehood or stupidity I don't know). Thanks for the welcome, Aporetic. And yes Manafon, even if these experiences only lead to a heightened curiosity, I guess that's something. I googled Crosby Towers and found some images but nothing about what you've experienced. I hope you're eye is getting better. Thanks for sharing this fascinating experience, and the history of Crosbie Towers - I'll do some more reading on it. It's always sad when property steeped with history is changed in the name of development or progress. I don't believe all change is good - especially in the name of progress. I look forward to reading more from you, and welcome to YGS - trolls and all. I have just used my daily limit and 'up voted' everyone. Don't worry about the 'down votes'. I 'up vote' everyday. Hi sushantkar - I don't think there's any real rhyme or reason behind downvoting epidemics. Often it would seem there are members who feel disgruntled for whatever reason (maybe they've been called out on a comment or account) and they want to seek revenge through downvoting the people they feel targeted or embarrassed them. Hopefully the "positive" karma police will make them seek out another hobby in time. To Manafon1, I joined as a member in the YGS family in the year 2014 and since then I haven't experienced anything like this before where an outlandish person is down voting valid and helpful posts to fulfill his filthy desires. But few days ago I read posts from older members that such thing had happened before also. Maybe senior members could put some light helping us to understand the cause behind this drama. Great points Michael. It would seem logical, if a person had been there, to make a noise on your subsequent visit to scare you off. I'm merely throwing out some other possibilities that could have been at play. I agree about the photo. It is subtle if it was someone trying to freak you out. For the record, I don't think it's an alien, it just vaguely looks like a stereotypical big eyed extraterrestrial. Demons and angels are out of my wheelhouse too. As you wrote though, if nothing else, your experience at Crosbie Towers ignited a sincere and open minded curiosity in the paranormal and that's not a bad attitude to have. Yeah, alien grey is what I thought too, or a 'demon', both theories as outlandish as the other. For one thing, I'm not a believer in Christian eschatology, so my first inclination would be to reject the existence of things like demons entirely. For me, they can only be real if God and their opposite - angels - are real. Still, I really can't say what the thing in the photo is. I guess I'll never know. As you say, it could well be a mask but, as with the bang on the staircase, it just seems an extreme length to take by a squatter. The whole circumstances were just weird. The bang occurred the first night we ever went to the house. The photo was taken on a subsequent visit where nothing else really happened, no loud noises or anything, even as we explored the rooms of the first floor. Why didn't they send us away screaming for good or make another bang? Its just weird. The photograph is just too subtle; its like we caught it out. Still, the whole experience has stayed with me over the years and encouraged me to find more of the 'paranormal', determining if there really is anything. © The ghost story Crosbie Towers: The Face At The Window is copyrighted to MichaelM95. Edited by yourghoststories.com.